Banks must help clients understand actionable analytics’ power and perceive the service’s value. Boston, July 27, 2016 – Traditional reporting is mostly a data dump gathered through bank processing. Analytics, on the other hand, globally provides banks’ clients with actionable data, frequently including comparative trends that drive decisions. Banks are challenged to grow treasury-services revenue and have significant volume of receivables data, but will their clients compensate banks for a value-added actionable receivables analytics solution? 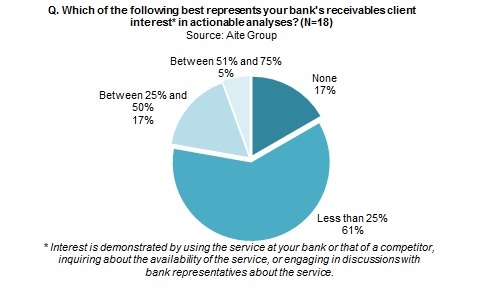 Based on Aite Group surveys of 19 receivables product managers or experts at 18 North American banks conducted from March to June 2016, this report suggests banks’ opportunities to provide clients with actionable data. It identifies banks’ current status of actionable data provisioning, the types of data banks provide, methods by which banks provide the data, and other important considerations. This 29-page Impact Note contains 12 figures and two tables. Clients of Aite Group’s Wholesale Banking & Payments service can download this report. This report mentions Angoss Software Corporation, Bloomberg, Capgemini, Cloudera, Dun & Bradstreet, Experian, Equifax, Facebook, Google Plus, Hoovers, IBM, Infosys/Finacle, InsideView, Intellect Design Arena Ltd., LexisNexis Risk Solutions, LinkedIn, McGraw Hill Financial, Moody’s, Morningstar, News Corp, SAS, S&P Capital IQ, S&P Global Market Intelligence, Tableau Software, Tibco Software, Thomson Reuters, TransUnion, Twitter, Wolters Kluwer, YouTube, and ZoomInfo.